The nose is not explosive it is somewhat restrained. I like the smell the most and it is going downhill from there. You can expect that this whisky has a woody influence, it has seen a cask for a very long time. But this should have been bottled quite some years ago. I will not even try to guess the distillery, it doesn't matter. It is a nice enough whisky, great to be able to drink a 50 year old for a fairly ok price. But I have seen much better whiskies at a better price. Maybe just not my style but the old wood and bitter elements are to dominant for me. Starting of with strawberry, dark cherries, marmalade, very dark chocolate. Very intense and concentrated. Old wood, old leather. Somewhat of an old library smell. Cinnamon and cloves. Then menthol and stewed strawberries, red cherries, oranges. Leaving the darkness behind and growing towards ripe forest fruits. Eventually it becomes fruity helped with some water it turns into a great whisky. Sweet red fruits, very old wood, honey. Grapefruits which is nice in the mixture. Giving it a somewhat fresher almost sour element. The fruits are covered by the wood and almost muddy elements. Again dark chocolates or almost pure cacao. With water the bitter edge remains. Bitter, woody at first tasting. Second sip still bitter but much less. Midlong finish with a little bit of strawberries, almonds, walnuts. A bit drying but the bitter elements remain. The least interesting aspect. I doubt this is Macallan, bro. Glenfarclas, Strathisla, Glen Grant are plausible, with Glenfarclas being the most likely. One can only look at the pricing to know this is very, very, VERY unlikely to be Macallan. And with something this dark, most likely it's not Glen Grant or Strathisla either. But hey, you never know. very nice 50 y old. but not worth 99 points. i think its time to clean the site of commercial reviews. people like jice51 and clairebackus... are only putting up shop links and fake notes. FAT. Leather, coffee, cocoa, a touch of refreshing menthol, dusty, slightly sour, sherry at it's best. Old Herrenzimmer, filled with spicy tobacco smell. Gorgeous! Zero alcohol, no stinging, no miss notes. For me, a typical, old Macallan from a paxarettgepimpten sherry barrel. Oha. Bitter-sweet, he spits on the tongue. Slightly sour. Mocha, espresso, old. Very, very soft. Spicy, becoming increasingly bitter. The 50 years in the barrel are tasty, but on the good side. Dark Toffee, Werther's Real. Men's chocolate and always coffee. Wow. Rum pot, topped with dark fruits, mainly plums. What a board. Soft and eternal. After 30 minutes you chew on the stuff. Always sweeter. Fermented fruits. It comes to the desire for a real coffee to get this plum jam from the mouth. An exceptional draft in the unmanageable whisky sea. The 50 years have let him mature to a special painting. No malt for every day and certainly not a malt for everyone. But so good for me that I had to have a bottle of it. Macallan? In the smell in any case. Tasty maybe, maybe not. Glenfarclas? Maybe that too. Anyway, in any case, a great malt. A superb whisky, with a beautiful, deeply fruity and jammy nose. The oak dissipated over time (bottled has been opened for 3+ months). I had it only at 91 points initially due to the tannins and dryness, but it's gotten better since. Now 93 points. 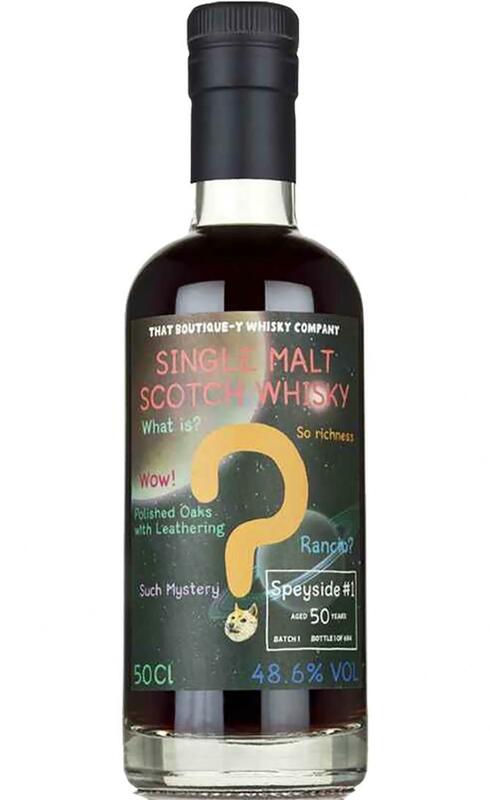 Nose: Bundles of thick, chewy dried fruits and dry, autumnal spices give this dram a Christmassy opening. Then earthy oak, milky coffee and rancio notes develop. There’s plenty of vanilla, butterscotch, old leather and green tobacco leaf underneath, with just a faint hint of smoke. Palate: Toffee fudge, dense treacle and molasses add a sticky, yet succulent sweetness which then cascades into darker, deeper tones of mocha, dusty oak and stewed blackberries. Zesty Seville marmalade adds pep among a tang of rhubarb and plenty of silky oak tannins against a backdrop of aromatic herbs and gentle bonfire smoke. Finish: An exceptionally long and sumptuous finish concludes with drying, ancient oak and a little black fruit compote. N: We are in serious tincture territory. This one deserves time. T: Dusty fruits and bitter herbal tinctures, hugely heathery with some bitter soot. F: It’s fairly woody but has done very well given its long journey in oak. It comes through a bitter wave to finish fabulously tobacco-dry. C: It’s hard to pin down given festival constrictions, but it’s another cracker.